The San Francisco Fine Arts Museum Legion of Honor is blessed with the exclusive exhibition of the finest art and furniture from the Petit Trianon, Marie-Antoinette’s renowned château on the grounds of Versailles. These objets are on loan until February 17, 2008 from the Musée National of the Château de Versailles while the Petit Trianon undergoes renovations. This is the first time that contents of Marie-Antoinette’s jewel of a château have been shown together outside of France. In 1774, when she was 19 years old, the fabled Queen Marie-Antoinette received the gift of the Petit Trianon from her husband, King Louis XVI of France. She was the first French Queen permitted to have her own private residence. The Petit Trianon was a retreat in which the Queen could relax, away from the formal royal court and its protocol, etiquette, intrigues and courtiers’ prying eyes. Designed by Ange-Jacques Gabriel, a preeminent 18th century European architect, the Petit Trianon was inspired by the neo-classical villas of Palladio and was a distinct break from the earlier 18th century rococo style. As used here, “small” is a relative term, since the perfectly proportioned château includes a dining room, library, music room, two drawing rooms, a master suite and thirteen guest rooms. It is definitely small when compared to the Grand Trianon, which Louis XIV built after demolishing the village of Trianon. Although the Petit Trianon had originally been commissioned by her father-in-law, Louis XV for his mistress Madame Pompadour, Marie-Antoinette redecorated the house and redesigned the grounds. She personally selected the beautiful and, for its time, restrained, interior furnishings to reflect her own taste. Certainly, the décor of the Petit Trianon is less ornate than the rococo golden Palace of Versailles. San Francisco Fine Arts Museum Legion of Honor’s exhibit contains 88 of the Petit Trianon’s finest furniture, paintings and sculpture, complemented by watercolors, prints, and drawings of the house and landscaping. What a treat it is to view these exquisite pieces and imagine Marie-Antoinette living among them. The furniture, porcelain and fabrics are all based on intricate floral motifs. The Sevres porcelain plates and coffee service set are delicate and graceful. With its luscious red silk fabric and detailed carved and painted woodwork, the elaborate bedroom suite is a highlight of the show. The landscape paintings by Guerard, Wallaert and Chatelet skillfully illustrate the then fashionable pastoral English-style gardens that Marie-Antoinette had designed and installed. The hameau, a model village of Normandy farmhouses and thatched cottages built around a man-made lake, is the ultimate garden structure. What makes this show exceptional, above and beyond the lovely art and furnishings, is its exploration of the truth behind the legend of Marie-Antoinette…her Austrian Hapsburg royal heritage, her marriage at the age of 15, her life at the palace, her children, her excesses, real and imagined, and her ultimate imprisonment and death by guillotine. 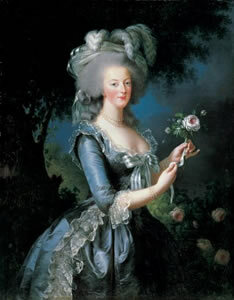 Some of the unfavorable myths and half-truths about Marie-Antoinette have been debunked by her biographers, including the 19th-century French biographers Edmond and Jules Goncourt and more recently, Antonia Fraser in her 2001 biography, Marie Antoinette: the Journey. http://www.marieantoinettebook.com/index.aspx. Notably, it is thought that she never uttered “let them eat cake” –the first speaker of that “lethal phase” was Maria Theresa, wife of Louis XIV. The 2006 film, Marie Antoinette directed by Sofia Coppola and starring Kirsten Dunst, is based on Fraser’s biography. http://www.sonypicutres.com/homevideo/marieantoinette/index.htmll. Though clearly not a great, or even a good, film, it nevertheless succeeds excellently in recreating life at the gilded halls of Versailles in all its outward splendor and inner turmoil. I recommend watching at least part of the film before attending this very special exhibit.